WELCOME TO YOUR OWN MOUNTAIN OASIS. 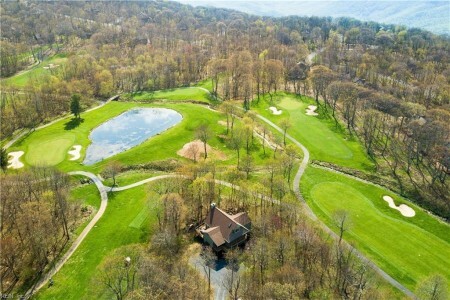 SITUATED ON .90+/- ACRES ON A PRIVATE PENINSULA OVERLOOKING THE 7TH, 8TH AND 9TH HOLES OF THE DEVILS KNOB GOLF COURSE. BUILT IN 2005 WITH FIVE BEDROOMS & FOUR FULL BATHS. LOWER LEVEL/FIRST FLOOR HAS A LARGE BEDROOM THAT SLEEPS 4, FULL BATH, RECREATION ROOM WITH FIREPLACE, BILLIARD AREA, LARGE STORAGE ROOM & MUD ROOM/LAUNDRY ROOM. MAIN LEVEL/SECOND FLOOR FEATURES KITCHEN WITH GRANITE AND NEW STAINLESS APPLIANCES WITH BREAKFAST BAR THAT OPENS TO DINING AREA, GREAT ROOM WITH FIREPLACE, SECOND LAUNDRY ROOM, MASTER BEDROOM SUITE WITH TWO MORE BEDROOMS AND FULL BATH. THIRD FLOOR HAS A SECOND LARGE MASTER BEDROOM SUITE. THERE ARE TWO SEPARATE DECK AREAS & THE VIEWS ARE GORGEOUS! PRIVATE LOCATION CLOSE TO THE SPA. ITS LOCATION ALLOWS FOR GREAT HIKES & AN EASY WALK TO THE DEVILS GRILL AND DEVILS KNOB GOLF CLUBHOUSE. PROFESSIONALLY DECORATED & METICULOUSLY MAINTAINED BY ORIGINAL OWNERS. USED AS SECOND HOME & RENTAL PROPERTY. RENTAL HISTORY AVAILABLE UPON REQUEST. Get pre-qualified by a local mortgage lender! Send me more information about the listing at 83 Gray Birch, Other Virginia, 99999, MLS# 10252445. This 5 bedroom, 4 bathroom home located at 83 Gray Birch, Other Virginia, 99999 has approximately 3,300 square feet. It is currently listed for 625000.00 and has a price per sqft of $18,939. This home is currently Active under the MLS#: 10252445. It is listed by BHHS Towne Realty. 83 Gray Birch, Other Virginia was built in 2005. It has Multi Car, Driveway Spc, Street parking. The kitchen includes Dishwasher, Disposal, Dryer, Dryer Hookup, Elec Range, Refrigerator, Washer, Washer Hookup. 83 Gray Birch is part of the All Others Va Area 51 neighborhood located in 99999.